Meeting your special person for a secret rendezvous? 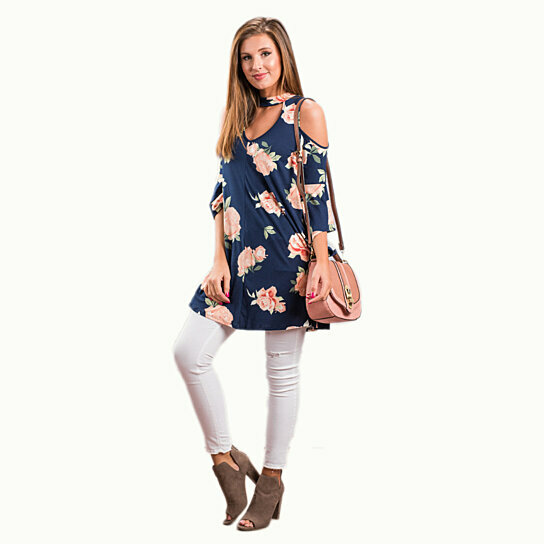 Wear something that will look beautiful on you and will make you feel beautiful too, like this tunic...!You did not know you needed this until you saw it...! You will fall in love with it at a first sight and you will stay in the mind and the heart of your special person forever and ever when he sees you wearing it ... Created with love in mind, a heart shape cutout at the neckline and back is attached to a cute high neck detailing that looks like a built-in chocker necklace! It is made of silky Polyester and Spandex blend. This high fashion lovely tunic has its own charm with flowy sleeves and rosy print. It comes in sizes like S, M, L, XL, AND 2XL. It comes in a Night Blue color with beautiful Roses, great for a date night. Please check the picture gallery.